I believe so. Nice collection! Those arrow heads look old GUTS...any idea how old they might be? The "gonnie" (rock) is a genuine primitive projectile. You left out the sharpened stick mate. The one on the left is from the Woodland Era, approx. 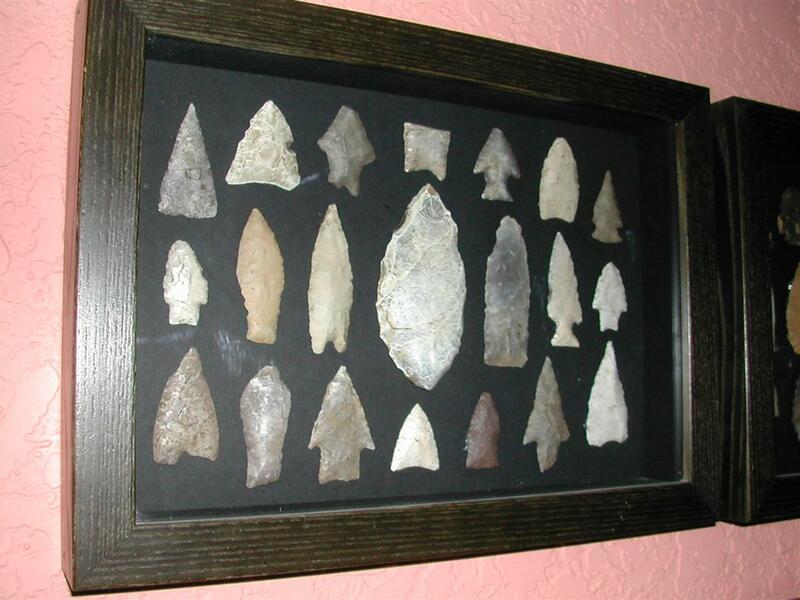 1200 to 1700 years old, the next one from the left(the bigger light colored one)is most likely early Archaic, approx. 2500 years old, the next one is also early Archaic, approx. 2500 years old and the little one on the right is the oldest, middle Archaic, approx. 4500 years old. I make my judements on the age of these projectiles from years field work and a lot of research. These points came from fields around here where I live. The lead ball looks to me to be a musket ball because it is rather crudely carved into a ball. The lead chunk and the ball came from the praire around here. The ball measures between .615" and .650". The bullets came from here also, the one on the left looks like it was fired into something at one point in time. They are both .45 caliber, probably 45-70 rounds. The lead chunk looks like it has been carved on quite a bit and is probably about the end of that particular blank. I just thought it was kind of neat to see the progession of projectiles from our area. WOW....I didn't think they would be that old GUTS. I sorta guessed at being a couple of hundred years old...but up to 4500 years...awesome. Do you come across these sort of things fairly easily? Are there quite a few of them just laying around waiting for someone to come along and pick them up? What sort of stone are they made from? I get the impression that you have a bit of an interest in things from antiquity. Nothing like holding a piece of history thousands of years old and trying to picture the original owner/craftsman. Makes you feel rather insignificant in the overall scope of things. I've also got lots (hundreds and hundreds) of arrow and spear points. If you live in an area that isn't picked over, you can still find lots of good stuff. 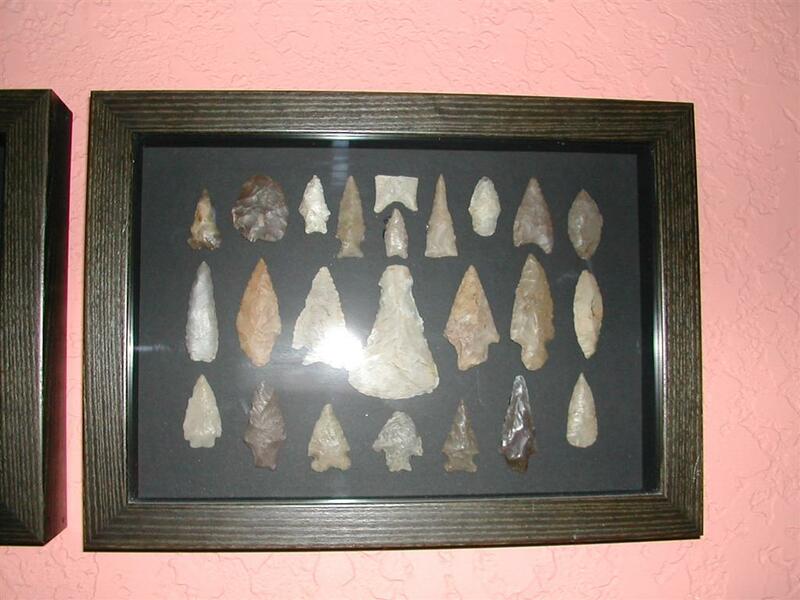 South Texas is still a great area to hunt for artifacts; it's not so picked over. Mine range from about 300 years old to about 12,000 years old. 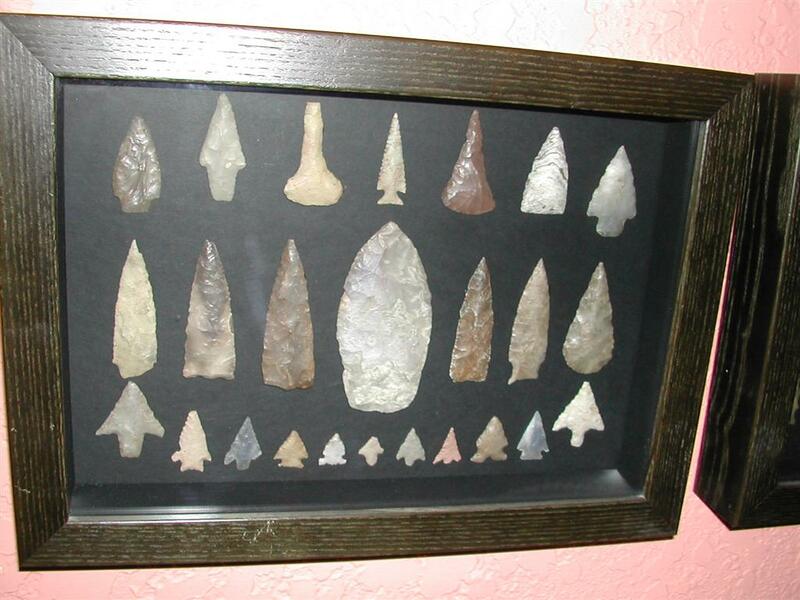 They, like most points are made from chert, quartzite, and a you might even find one made of one of the several volcanic glasses (obsidian), if you live near an area that had produced that type of material. 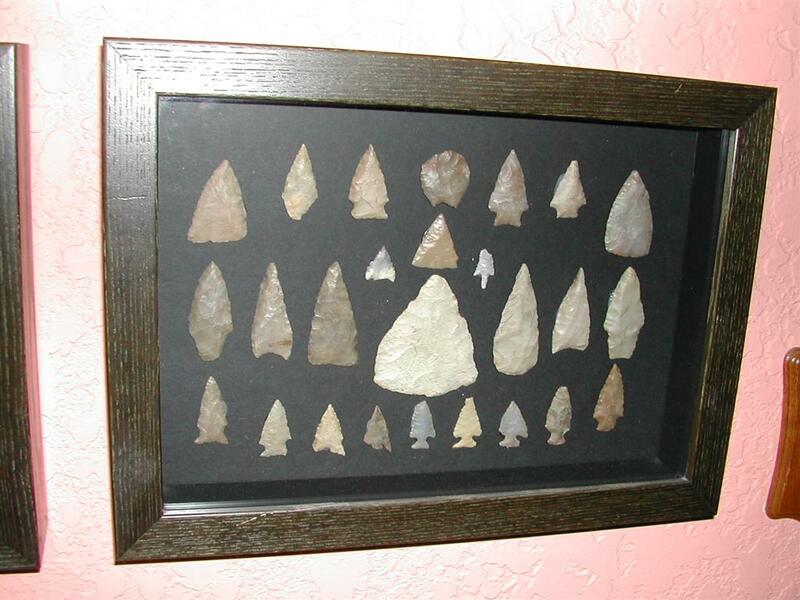 Most are chert (flint). I also have lots of old ammo that I found with my metal detector. I'll see if I can get some good photos to send. One thing I forgot to say is that, if you are out hunting in an area with a permanant water sorce, check the high banks (out of the flood zone, with an easy acess area down to the water's edge for camp sites. This is always good areas to look. I've gone into areas that were already picked over and found hundreds of tools. You have to look for the man-made chip marks and not just the shape. If you think an area would be a great spot to build a home....primitive man probably felt the same about that site. Another thing I forgot to say is that I occasionally work with archeologists on dig sites. WOW Cary...that would be awesome to do that. I have a bit of a fascination with archeology, and anthropology (to a lesser extent). I find it awe-inspiring to be able to find and handle something that primitive man made. I would love to be able to do that, but out here you have to travel into the really out of the way places to get to do any searching. In fact, I would have to travel for at least 3 days to even get close to any reasonable sites. Vince, I saw that the indigenous Australians have been around for something like 40,000 years. I don't now much about the population densities or culture but I'd think you could find some sign of them about anywhere there was terrain that would sustain them. Yep, you are right Punkin...they have been around for many 10's of thousands of years...but they used mainly wooden tools...they weren't as "advanced" as some other cultures. The vast majority of the archeology found is cave and rock paintings. Occasionally a stone implement will surface somewhere, but they are very primitive...nothing like the arrow heads that GUTS has shown. Here's a small portion of my artifacts. The 4 cartridges on the right are rim fire, with the largest being about 50 caliber. The next two, from right to left are cartridges that were stuck inside each other. I've found lots of these. I believe these were done by children playing. 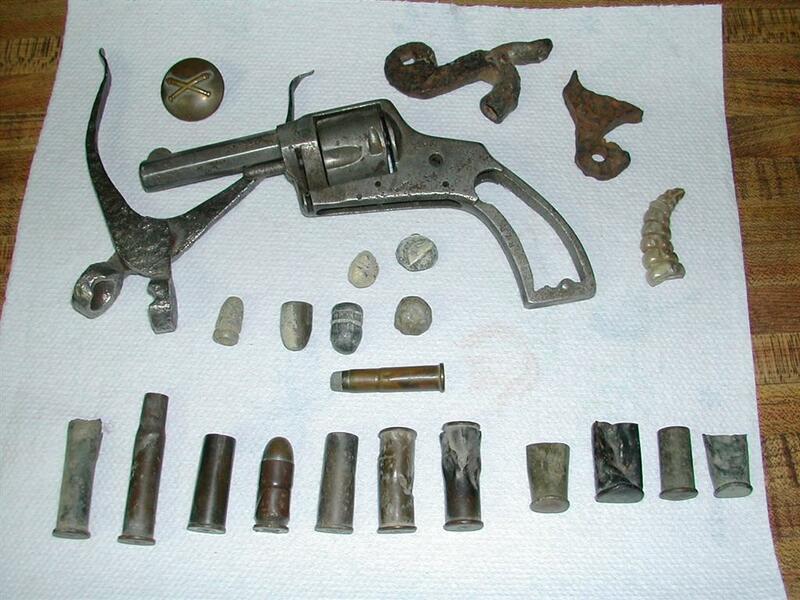 All of the guns and ammo artifacts were found in the ghost town of Fairview, Texas. I spent the first 18 years of my life there. Great place to hunt for artifacts. That is a brilliant collection Cary...absolutely awesome. As said earlier...I would love to be able to search out artifacts like that. Thanks for showing them mate.